When you?re deploying emerging high speed serial bus technology, identifying spectral content of wide-bandwidth RF signals, or analyzing transient physical phenomena, you need the truest representation of your signals under test. 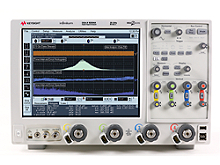 The Keysight Infiniium 90000 X-Series oscilloscopes are engineered for 33 GHz true analog bandwidth that delivers. By investing in a proprietary integrated circuit process, Keysight has enabled high-frequency capability while yielding the industry?s lowest noise floor and jitter measurement floor; giving the 90000 X-Series true analog hardware performance to 33 GHz. Other vendors, limited to 16 GHz hardware technology blocks, employ various techniques such as digital signal processing boosting and frequency domain interleave to increase the bandwidth specification of their scopes. However, these methods increase noise density and distortions with detrimental impact on measurement accuracy. The 90000 X-Series deliver the lowest noise and have the lowest jitter measurement floor in the industry, ensuring superior measurement accuracy.